A detailed look at the background of the massive series of chemical explosions which rocked the port of Tianjin in China last week. Late into the night on August 12, two massive explosions rocked the Port of Tianjin, immediately killing dozens and injuring hundreds of people. The explosions appear to have been caused by several hundred tons of unsafely stored sodium cyanide, in the container storage lot of Ruihai Logistics, a firm specializing in the transport and storage of hazardous materials. As of 9am August 19, 114 people were confirmed dead, among them 19 Public Security Bureau firefighters, 34 port firefighters, and 7 police officers; a further 65 people are missing, while 674 have been hospitalized. While public organs and journalists continue to investigate the exact causes of the blast, the backstory to the tragedy has gradually come to light. Ruihai, its insecure workers, the frantic development of the Port of Tianjin, and the especially severe abuses of power resulting from a powerful state bureau turning into a capitalist enterprise – all these are parts of the picture. If an explosion were to happen at any port in China, Tianjin would have been a likely candidate. Handling more than 477 million tons of cargo and 13 million TEUs in 2013, Tianjin is the 3rd busiest port by raw tonnage and 10th busiest container port in the world. It has a long history as a major trading port in China: an important foreign concession forced open in the Second Opium war, it continued to function as a major port during the socialist era, and then grew by leaps and bounds after “Reform and Opening” (economic liberalization) began in 1978. Tianjin is the closest major port to Beijing, and part of the important Bohai Economic Zone, one of the three clusters of economic development—along with the Pearl River Delta and Yangtze River Delta—that have benefited most from China’s economic liberalization. For Tianjin and its port, the past thirty years of reform have meant explosive and sometimes careless growth. Chemical factories have recently become a hot topic for environmentalist and NIMBY-style civilian protests—famously in Wukan in 2012, and in Shanghai this year. But logistics centers, where these foreign-bound chemicals are shipped in and out, are less visible yet even more dangerous nodes in the supply chains of global chemically-dependent industry. Tianjin is a reminder of this reality. While the Tianjin explosion is an incident reminiscent of the Lac-Megantic train derailment, a disaster that reminds us of the significance and dangers of the extensive modern supply chain, the disaster was also a uniquely Chinese incident—the product of powerful state institutions transforming into hefty commercial enterprises, management becoming directly subservient to commercial logic. A lot of the conversation around responsibility for the Ruihai case has focused on the sketchy approval process for the company’s hazardous materials handling. Ruihai International Logistics was founded in 2012 with an initial capital of 50 million yuan, for storage and transport operations. It now handles 1 million tons of freight annually and has an annual income of over 30 million yuan. While the company had long dealt primarily in hazardous materials, handling chemicals for a major domestic chemical company, it was not until June 23 2015, just months before the accident, that Ruihai received the proper documentation to handle hazardous materials at the port. Clearly, for two or three years, someone had turned a blind eye to Ruihai’s operations. Ruihai was allowed to operate at the port without any apparent external oversight. This may be because the Tianjin Port Group, the port’s commercial operator, doubles as its own regulator. When reporters sought out the Binhai New District’s Work Safety Committee—the body normally responsible for hazardous chemical business approvals—for questioning about Ruihai’s operating credentials, they were told the Committee had nothing to do with Ruihai’s approval. This was not merely deferral of responsibility. Ruihai’s documents were approved by the Tianjin Port Group, which has a set of independent approval procedures not subject to Binhai New District’s control. The permits they applied for were the “People’s Republic of China Port Operations Permit” and “Port Dangerous Cargo Handling License”—granted by the Tianjin Port Group—rather than the more common “Hazardous Chemicals Operation Permit”. The Port Group, which profited from Ruihai’s illegal and unsafe business, was at the same time the entity responsible for overseeing and licensing the company. The conversion of political power into economic weight is again reinforced by familial ties. Since the explosion, reporters have uncovered that Li Liang (李亮 ), the company’s main shareholder and its legal representative until the position transferred to Zhi Feng (只峰) January 29 this year, is the nephew of former Politburo member and chairman of the Chinese People’s Political Consultative Conference Li Ruihuan (李瑞环) and for this reason the company has received “conveniences” throughout its short few years of existence. The connection is reinforced in the company name: Li Liang’s father Li Ruihai (李瑞海), Li Ruihuan’s younger brother. Meanwhile, secondary shareholder Shu Zheng has pleaded innocent, claiming that he is merely the nominal shareholder on behalf of friend Dong Shexuan (董社轩), son of the late Tianjin Port Public Security Bureau chief Dong Peijun (董培军). The people so far connected to the company are a complicated web of other major players in the chemical industry and major officials. While the details of the case are still being sorted out, that Ruihai involved significant transformation of political capital into economic heft is undeniable. These powerful connections as well as the independent authority of the port allowed Ruihai to operate under blatantly illegal conditions, even after its official licensing. The direct connections to the explosion are obvious. Whereas the Tianjin Administration of Work Safety’s standards for hazardous chemical handling required stacks of containers to be kept at least 0.8 meters apart, that no more than 500 grams of chemicals be stored together, and that the total amount of chemicals be no more than 2 tons, Ruihai kept its stacks a mere 0.4-0.5 meters apart, and would store 6-30 tons of chemical in one container, according to two truckers working for the company. Furthermore, Ruihai was only permitted to store its hazardous chemicals in the port’s heavy container storage area, but logistics worker Li Hua told reporters that the company instead kept most of its chemicals in transitional storage. Ruihai’s riding roughshod over regulations also put nearby communities in harms way. Regulations mandate that dangerous chemical be stored at least 1000 meters from public buildings or major thoroughfares, but Ruihai’s storage area was constructed a mere 600 meters from two existing residential communities that house over 1000 residents. Once again, they proceeded without anyone raising a cry. While plain corruption affects environmentally sensitive construction all over the world, the Port of Tianjin is a convoluted legacy of state power used for market purposes that has made it all the more flagrant. The status of the port as an entity independent from the city also significantly affects the leeway Ruihai exercised. This is a legacy dating back to socialist times. China’s major logistics and transportation arteries once operated under direct state control; its ports and railroads once operated as independent kingdoms, powerful state bureaus that managed the living conditions of workers as well as all aspects of operations, independent of local government. The Tianjin Port Group was formerly the Transportation Department Tianjin Port Management Bureau (交通部天津港务管理局). Answering directly to the central government Transportation Department, it operated independently of local Tianjin authorities. It was only in 1984, in the early days of reform, that the Transportation Department Tianjin Port Management Bureau became simply the Tianjin Port Bureau (天津港务局), coming under the control of the municipality of Tianjin with the Central Transportation Department as secondary overseer. Further reforms in 2001 cut the port off from the Transportation Department, and put it fully under the management of Tianjin. But while the port’s designation changed, its staff did not, and port business remained largely out of the grasp of local government. This was still the case when in 2004, when under central government directives to separate port operations from port administration, the Tianjin Port Bureau became the commercial entity the Tianjin Port Group Ltd. (天津集团有限公司) and administrative control over the port was handed to the Tianjin Transportation Committee (天津交通委员会). The Transportation Committee, however, stayed out of the picture while a newly commercialized port accustomed to operating as an independent kingdom kept control over most aspects of operations, from business decisions to operations licensing to hiring its own police force outside of the municipal government system. Effectively, the Tianjin port changed hands from one administrative home to another and transitioned from a state bureau to a commercial enterprise, without ever changing its internal composition and remaining largely a self-governing zone. The port has retained the independent power and economic weight it once had, while shifting its mandate from one of paternalistic overseeing of the well-being of workers and working on behalf of the national economy to one of making profit for itself. This has transformed the weight of an old state bureau into a powerful company subject to little outside control. The dispatch worker firefighters who rushed to the scene, dozens of whom died in the explosions, epitomize the transition of the port. The port’s former identity as a State Bureau and socialist institution have made no difference for the Port of Tianjin when it comes to the trend of casualization hitting manual labor jobs like port and logistics work everywhere. Ruihai Logistics had a workforce of 70 full time employees and 20 dispatch workers at the time of the explosion, well above China’s legal maximum of a 10% dispatch workforce. This is a common phenomenon in the warehousing and logistics industries around the world, which rely heavily of temp workforces and labor contracting agencies that respond flexibly to the ups and downs of the market cycle in just-in-time production. Yet what startled observers was not the temporary condition of Ruihai’s logistics workers, but the temporary workforce doing the critical work of port firefighting. The Port of Tianjin firefighters, independently managed by the port, are not the normal public servants that serve other places, but rather contract workers managed by a company, which is in turn hired by the port. The firefighters are hired and fired as needed. This is another way in which the port keeps its operating costs low and reduces its burden of staff management. The revelation of the contract worker status of port firefighters left many civilians asking, should such a risky and critical profession be left to contract workers? Why was the port allowed to keep such matters in its own hands? The answer is clearly no. While public firefighters later arrive on the scene too, the private port firefighters who were stationed the closest and arrived first on the scene make up 34 of the 53 firefighters who died. Alive they were subject to the whims of the port, who could hire and fire them at will. Dead, it is only with the public scandal that the explosion has caused that they were promised equal compensation. Li Keqiang in the wake of the explosion made a point of stating it didn’t matter whether firefighters belong to the state administration or not, they were carrying out the same duties and deserve equal compensation. That the situation begs the premier’s clarification says all that needs to be said. One can imagine the situation these workers who regularly risk their lives would face were they to be maimed or to perish in obscurity. 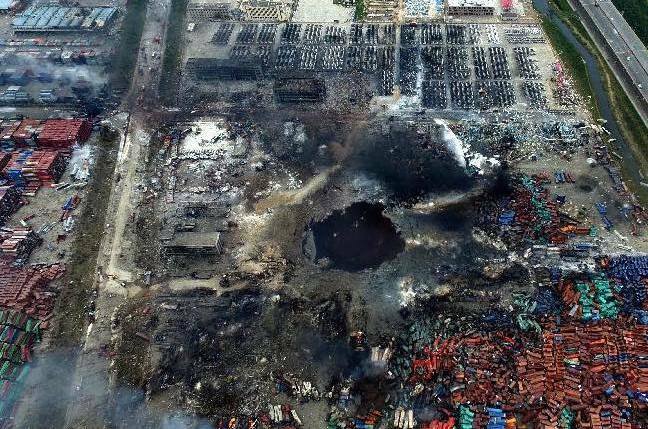 As for Ruihai’s own workers, it is unclear how many who died were temp workers, but as groundbreaking.cn notes, we know from the Kunshan explosion and other such disasters who is usually on the ground in the middle of the night. Of the 97 people who died in that explosion at 7am in the morning, every single one was illegally hired. In such things, it is always the most vulnerable who are sacrificed. Of the Tianjin accident, too much was not accidental. Neither the rampant pressure for growth that gave birth to shortcuts and heedless rule-breaking, nor the collusion of profit-making and regulatory powers that came with the state working towards privatization. It was not an accident that the explosion site was situated so close to housing complexes with over 1000 residents, nor that Ruihai’s blatantly illegal handling of explosive chemicals was ignored. It was not an accident that many of those who died were contract workers, living day-to-day without security, and even in death, without guarantee of compensation. Tianjin reminds us of the critical role that the logistics industry plays in the global market, and of the insecure workers who often staff it.